Is it that time of the year? No, not the bell ringing christmas holiday. I mean the time prior to that. To the times where you start to cuddle under a warm blanket while sitting on the couch, drinking lots and lots of tea, going out for a walk, breathing in the fresh slightly cooler air, watching the leaves turn so beautifully pink, red & orange. And speaking of orange – there is one more thing not too be missed in these times. The completely amazing pumpkin soup. What else makes it so clear that autumn has arrived? October is officially the cannot-eat-enough-pumpkin-month! At least in my world. From oven-roasted, to cookies and pumpkin chai drinks ( recipe is in the making), to soups. From butternut, to hokkaido or spaghetti squash, there is endless good stuff happening. A hot healing soup full of spices happens to give me comfort, health, warmth and makes me love autumn a little bit more ( even on the cold & rainy days). I am a firm believer that green food has to be represent in a healthy diet. But we tend to forget the other great colours. Like there are green lentils. But there are also yellow or red ones. Green Hokkaidos & Orange Hokkaidos. 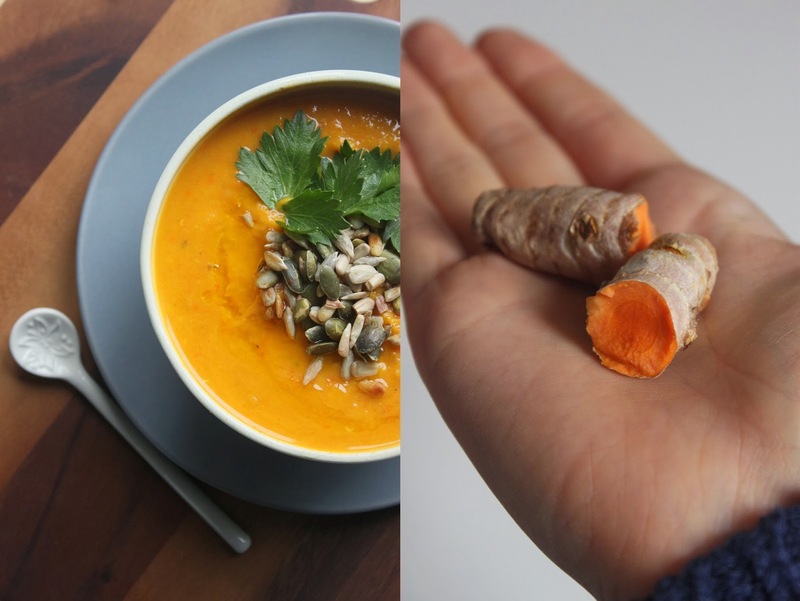 There is rightly much going on with green superfood powders but let’s not forget another great great superfood, raw or in its dried powdered form – the turmeric root. A proud exponent which bursts with the orange colour. Orange should tell you from now on: healthy, healing, including highly antioxidant properties! Turmeric has been used for thousands of years and is a huge part of the ayurvedic medicine. It gives dishes a tempting orange/ yellow colour and is considered holy in India. the metabolic and digestive systems. Orange is the colour of the sacral chakra, the reproductive system. the body and reduce the damage they are able to cause DNA and cells. When cells are healthy the body is healthy! Typically used in its dried, powdered form, you can also buy the roots and use them fresh, like its family member ginger. It is a natural antiseptic and can be used to treat burns and cuts topically. protein, fiber, iron, calcium , magnesium, zinc, potassium and the vitamines C, E, K.
This Recipe makes a lot. It lasts in the fridge up to 3 days. Either serve it to a few people or freeze the rest. Personally I like my soups pretty thick and creamy. If you want a clearer runnier soup just add more water/vegetable broth/coconut milk. Start with washing the pumpkin. Cut open, remove the seeds and cut it into chunks. Peel the Carrots, sweet potato and celeriac root. Take a few celeriac stalks and save some of their green leaves for later. Cut all veggies in little pieces. Rinse the lentils. Continue with cutting the onion, garlic, ginger and turmeric and heat them up covered in the canola oil in a large pot. Add the salt and all spices except the pepper. Lower the heat. Slowly add the water. Bring to a boil. Add in the vegetables. Cover and lower the heat, cook for 20 minutes. After 10 minutes you can add the lentils. 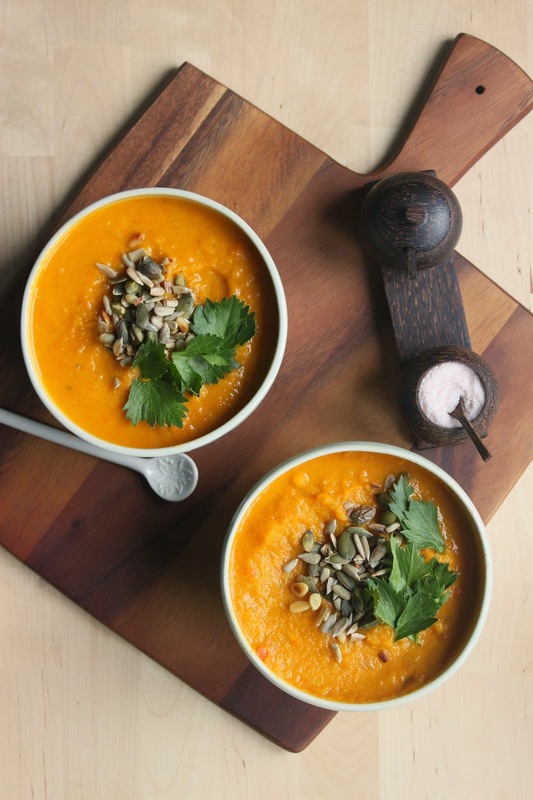 Take your hand blender, blend the soup for a few minutes, add in the coconut milk. 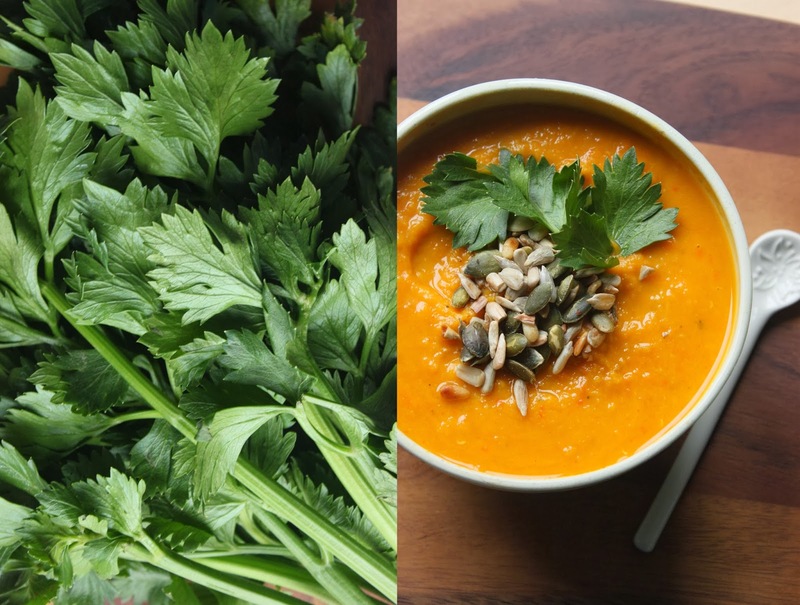 Roast the seeds and garnish the soup with some chopped celeriac greens, pepper and flax seed oil. It will change your life! Word! Do you have a beloved autumn food/dish? Drop me a line in the comment section, or meet me over there! Beautiful recipe! I will have to make it soon! Thanks for sharing!